“Import” button added – overwrites currently active kit config file with the contents of another kit config file. 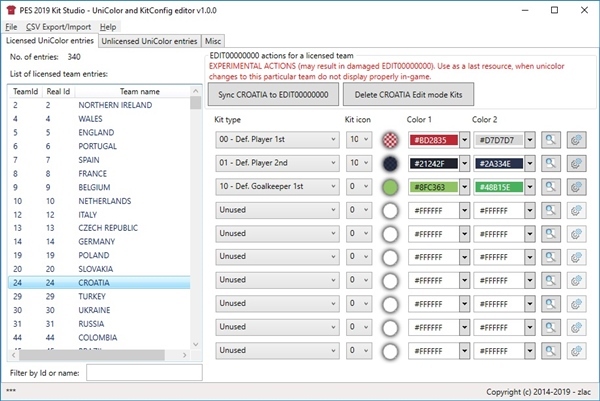 synchronization of kit references between UniColor.bin and EDIT00000000 (from Unicolor to EDIT only) – semi-experimental option that may (or may not) solve the problems that appear when changes to kit distribution in UniColor do not show in-game because the game (i.e. community patches) is already using EDIT00000000 file with different kit distribution. ability to delete kits stored in EDIT00000000, that were created in Edit mode (two options – deletion of all edit mode kits per individual licensed team (on ‘Licensed UniColor entries’ tab) and global deletion of each and every edit mode kit available (on ‘Misc’ tab)) – another semi-experimental feature which may or may not solve the problems that appear because data in UniColor and EDIT00000000 are not ideally synchronized.